I celebrated Victorine Meurent’s birthday this past Wednesday, February 18. She was born 171 years ago, in 1844. (She died in 1927, at 83.) I know a few other people celebrated along with me because I got some favorites and retweets on Twitter, as well as some likes on Facebook. 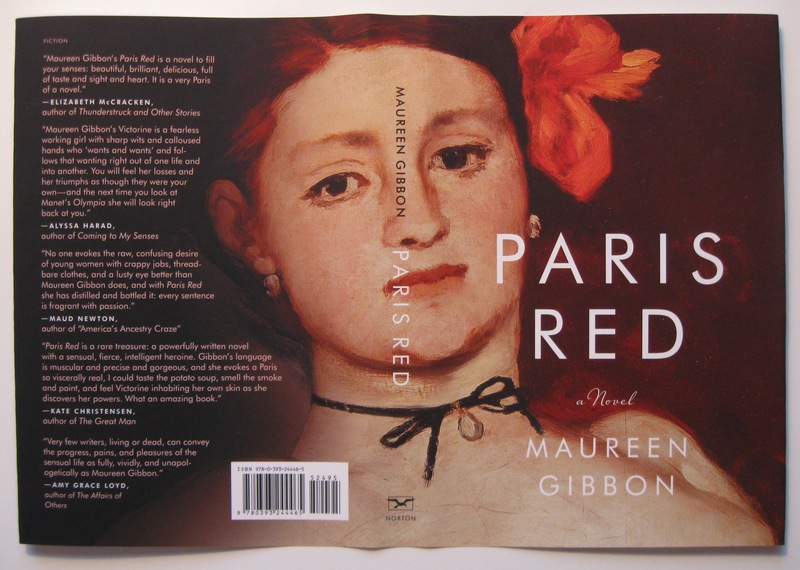 I thought it would be a quiet day of thinking of her, but in the afternoon I was the one who received a gift: author copies of Paris Red arrived from W. W. Norton. I knew the books were ready, but I didn’t know they’d arrive that day. My friend Silvana said it was “a lovely synchronicity,” and I agree. I know I said this before, but now I know who to thank: I love how designer David J. High got Victorine’s earring to nestle between the P and the A of Paris, and how the end of her neck ribbon leads to my name. It takes many, many people championing a book to bring it to publication, and I thank my blurb writers from the bottom of my 50-something-year-old heart. In the photo above you can see blurbs here from Alyssa Harad, author of Coming to My Senses; Maud Newton, author of “America’s Ancestry Craze”; Kate Christensen, author of The Great Man and Blue Plate Special; and Amy Grace Loyd, author of The Affairs of Others. What you can’t see in this photo is the blurb on the front flap from Cara Black, author of Murder in Pigalle and the soon-to-be-released Murder on the Champ de Mars. You also can’t see the blurb inside the back flap from Ross King, author of The Judgment of Paris. 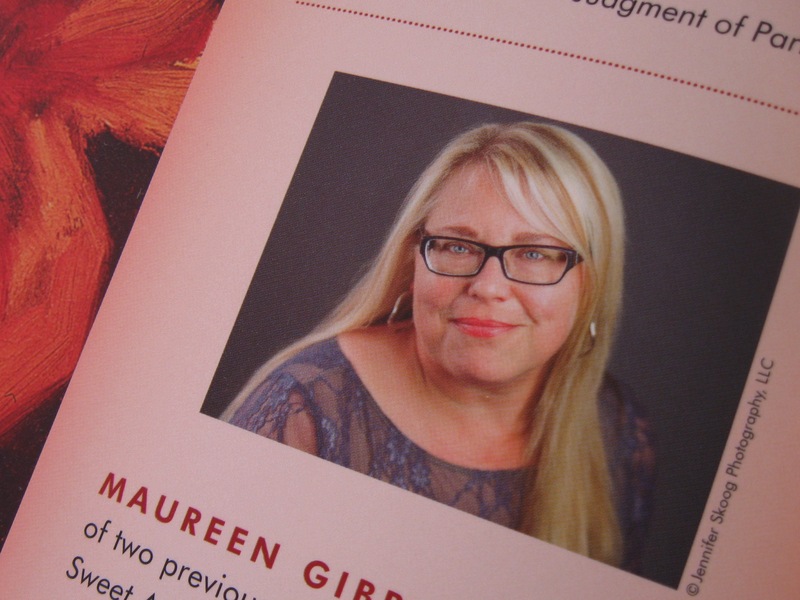 After I let myself absorb all of the beauty and kindness I see represented in the jacket image and the blurbs, I turned to a tiny detail on my author photo. Jennifer Skoog made me look as glamorous as it is possible for me to look in that photo, and the lipstick I’m wearing seems to match the warm red of the flower behind Victorine’s ear. There might even be some synchronicity at work in my lipstick choice. For my photo I wore Lancôme’s Miss Coquelicot—poppy. Coquelicot is the French word for the flower and its particular shade of red. I’ve just finished reading “Paris Red” and enjoyed it very much, especially the character of Victorine: her love of colour and her determination to follow her own path. The artistic process and the interaction between artist and model were very well portrayed. Now I’ve explored your fascinating blog and will be back soon for more. I am so very glad you liked Victorine’s story. It was a joy for me to write about color through her eyes. Thank you for your kind words, and for taking the time to write to me!